Last year I mentioned I was going to pause my Project Management businesses, with the intention of concentrating on Lenscraft and photography. This is a big step as historically the Project Management has helped cover the running costs of Lenscraft. But, Lenscraft and photography are my passion, so I have finished my final contract and am now focussed 100% on photography. I have lots of improvements planned for the next 6 months. But my goal remains to help as many people improve their photography as possible. I also have a new Lenscraft Logo. From time to time I explore how some of the visitors to Lenscraft find me. Often this reveals problems people have, giving me ideas for articles and tutorials. One forum discussion (argument) appearing regularly is “can you use micro four thirds for landscape photography”. 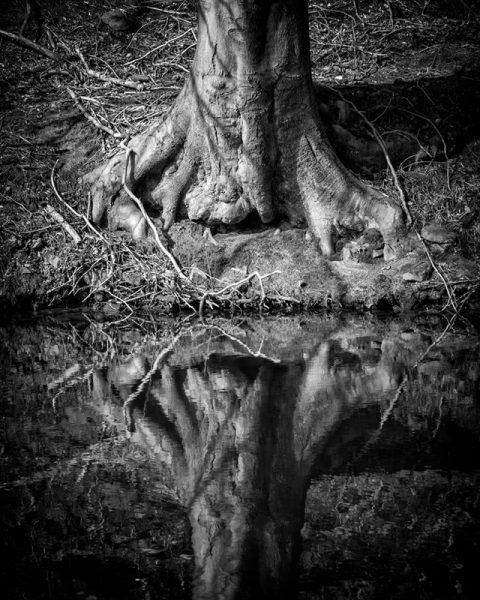 One such link appears to have been triggered by someone at a filter company advising a potential company “the M43 system is useless for landscape photography”. The discussion then goes on to argue the merits or otherwise of micro four thirds. Ultimately the answer to the answer to the question is yes, Micro Four Thirds (Micro 43) can be used for Landscape Photography; it even has some advantages over larger cameras. There are though limitations you need to know about and possibly work around. This article shares some of my tips to shooting landscapes with Micro 43 and other small sensor cameras. You will have heard it many times before, but it needs to be repeated “Shoot using RAW format”. This though only gets you into a good position from which to develop your photograph. To produce excellent images from a RAW file you need to perfect your processing, and this is particularly true for Micro 43. Invest time to develop a processing workflow for your RAW converter. Give special attention to manipulating image Tones, Reducing Noise and Sharpen your RAW files. These are the key areas dictating image quality for Micro 43 RAW files. Shooting in RAW format has allowed me to retain large amounts of detail in this image. It was captured using a Sony RX10 which has a small 1" sensor. You can continue to read the full article on the Lenscraft website (https://lenscraft.co.uk/micro-four-thirds-landscape-photography/). The Members Websites page recently on Lenscraft recently stopped working. I have now fixed this and took the opportunity to remove any sites which are no longer live. If I have removed your site and you want to have it relisted, please let me know the new web address. Equally, if you weren’t aware of this page and want me to add a link to your website, flickr page or other online portfolio, please use the form on the page to submit your details. Recently I realised many Lenscraft members don’t know where to find my work and often end up missing out. Here’s a quick guide to some of the areas, which also appear in the footer of this email as shown below. Links you will find in the footer of this email. This is the main Lenscraft website. As you’re reading this newsletter it means you’re a member. 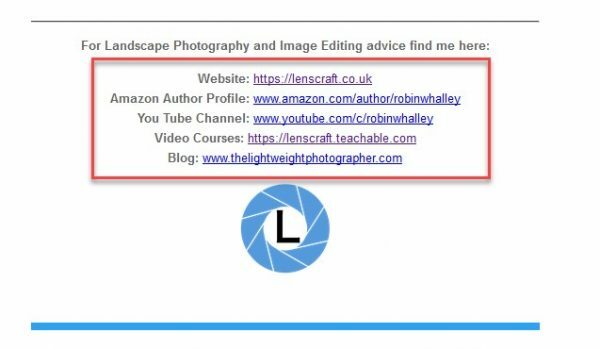 This gives you access to the restricted content in the members area, as well as all tutorials and videos and you benefit from Lenscraft discounts. I will be publishing many more articles and free tutorials in the coming months. Keep an eye out. As an author on Amazon, I’m provided with a dedicated author page. Here you will find all the books I have published on Amazon. That’s 19 books to date and I’m working on number 20. There are two author pages, Amazon UK and Amazon US. If you’re in a different country, you can still view these pages. Many Lenscraft members aren’t aware that I have a You Tube channel full of free material. Currently I have 46 videos, that’s around 8 hours in total, covering photography and image editing. Now you know what to do when it’s raining. Anyone can watch these but if you have a You Tube account, you can subscribe to my channel using the “Subscribe” button shown below. 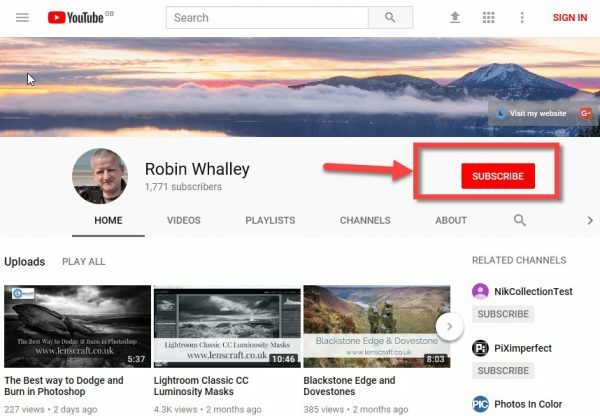 Subscribing means new videos appear in your subscriptions list and you’re less likely to miss any. I publish video courses on my Lenscraft Training website. This is a separate site from Lenscraft and is hosted by an excellent company called Teachable. Currently there are four courses available, one of which is free. I’m working on more courses and intend to start publishing free tutorials here in the future. I post here a couple of times a week. It’s a mixture of images, thoughts, news and things I’m experimenting with. It used to feature tutorials but I’m switching to using Lenscraft and Lenscraft Training for these. Recently I published a blog post suggesting I might close the blog down. Following an amazing response both on and off the blog, I’m absolutely committed to keeping it going. I hope you find these sources helpful. That’s all for this month.